Could Apple’s butterfly keyboards have a cold aversion? My modern Apple LiOn batteries only last 2-3 years. They used to last longer. I wonder if being cooled to -20F shortens their lifespan. Leaving them in the car in a MN winter will do that. I knew this was true of humans, but it seems to be true of at least one dog. Kateva, our dog, is near the end of her life. She’s a decent age (14y4m) with liver disease, a lung mass, and arthritis. No more health food for her. Kibble with ice cream, white chicken over chicken broth flavored kibble warmed in the wave … she eats like a Queen. Alas, you can out-eat exercise, but you can’t out-eat cachexia. Sam, a guest, is younger and healthier. He’s still on kibble. Which he normally eats — but not when Kateva is getting gourmet food. Then he goes on strike. Add a bit of ice cream and he devours everything. What if IT costs act as a barrier to entry and promote monopolies? Perhaps IT productivity gains are very positive in some domains, negative in others, overall relatively modest. What bacteria live in dishwashers and how do they change family microflora? I’m sure study has been done. Surprised I’ve not heard of it. … is to pay physicians by the hour. Lack of directory service for URLs. The 2nd seems solved. The 1st I curse a few times a week. The 3rd is the worst. Cutting edge of sociology is intersection of machine learning recommendation engines, human delusional disorders, and societal disruption. I think second time for this … Adobe Digital Editions hangs. The EPUB actually downloaded, but the app hangs trying to open it. I found it via Finder and moved it to iBooks manually. Federal employees are unionized but cannot strike. Unions can not negotiate wages, only work conditions. So they have one lever. The right of stasis. Change requires a sweetener. Throughout his career Trump won by being so miserable that other people were willing to pay to get away from him. Because we can’t get away from him. Wirecutter is reducing product quality. Wirecutter doesn’t measure product reliability. Reliability is expensive. So Wirecutter recommendations must drive reliability down. The case for the Wall the GOP can’t make. Broken US healthcare no. 435: supplemental Medicare and observation status. Medicare doesn’t cover observation status and neither do some (all? many?) supplemental plans. Hospitals like observation status because it dodges some evil payor schemes. We get smooshed in the middle. Did anything sway WWCW from Trump in 2018? Did they ever vote for a female Dem? I’m looking for numbers. My suspicion is WWCW want a male presidential candidate (more than white, male). They are the deciders. We need to weaken Murdoch media. Ideally destroy it. That means Fox and WSJ. NEVER subscribe to WSJ and don’t tweet WSJ. Don’t stay at hotels that play Fox. Don’t go to the gyms. Complain at airports. I pick the scenic route from Madison WI to the Dells. Old highway 51. 20% slower, 1000% more interesting. Google Maps lets me do that. And five minutes later it reroutes to a faster way. The freeway. The AI maximizes utility. Once my preference counted, but now only speed matters. The human makes too many low utility choices. So I add a waypoint. It seems to pin the right route. Once I hit the waypoint though the route flips again. It needed more waypoints to keep on track. Finally, frustrated, the AI sulks, rerouting endlessly. Something like this I think. But not a full Boltzmann brain. More like the origins of life on earth. A small fluctuation of quantum foam that does a local measure. The Planck unit of measurement, or pmeasure. That propagates, and in no-time at all we have a slice of universe. Bit like every stone block holds every sculpture. Looking forward to real-time video avatarness on my 2024 TeleHealth doctoring. Hair from thin white to a hint of silver full, wrinkles gone, eyes wider and twinkly, chin advanced. Best I could do was navigate to https://www.att.com/my/#/mmdflanding?selectedCtn=555-555-1212 (fake number) then look to bottom for “See your Customer Service Summary”. I don’t think it could get more obscure. So now we know there is an industry in legal extortion; a market solution to the problem of power and Id. Businesses collect damaging information about wealthy people. Then they negotiate between parties on the cost of suppression. We have known this as the tabloid industry. I suppose that was a cover story. Rupert Murdoch started in that industry. It would be interesting to know mortality rates of the sellers. Outlook views are beautiful. Discovered recently that in a high volume environment of rapidly changing priorities and tasks that ‘last modified’ is a surprisingly useful way to view my tasks. More than priority or Due Date. I can only do that in Outlook. I’m pretty sure Google Maps’ travel estimates kill people. … because if #bullshitjobs is correct then workers are much more disposable than employment numbers suggest. From an article about a woman with a progressive genetic lung disorder in Silent Sports July 2018. This is known as spitting in the face of Death. … as in all of molecular biology, closer inspection not only reveals a wealth of impressive detail, but huge numbers of things which do not so much appear to have been carefully crafted by a divine hand, as much as assembled by a blind lunatic with infinite time, infinite willingness to tinker (and a correspondingly infinite willingness to accept whatever works as soon as it does), and infinite supplies of duct tape, super glue, and baling wire. What’s more, the whole mechanism keeps falling apart over time in subtle (and not so subtle) ways, which just leads to casual repurposing of the altered pieces. I learned how this happens by analyzing 19th century freight train breaking systems when I was 17. When will AI explore equivalent representations in math-space? Wiles proof of Fermat’s Last Theorem borrowed from from algebraic geometry and number theory (Wikipedia). Presumably these are equivalent representations for some problems. I imagine this as the grown-up equivalent of switching from Cartesian to polar coordinates to solve a freshman physics problem. I wonder when AI will start exploring math-space, searching for more of these unexpected alignments and concordances. It feels like that might happen soon, but I have no idea how it would work. Japanese mathematician Goro Shimura, drawing on ideas posed by Yutaka Taniyama, conjectured that a connection might exist between two different mathematical objects then being studied, known as elliptic curves and modular forms. Taniyama and Shimura posed the question whether, unknown to mathematicians, the two kinds of object were actually identical mathematical objects, just seen in different ways. What I’m describing is an automated search for “identical mathematical objects … seen in different ways”. 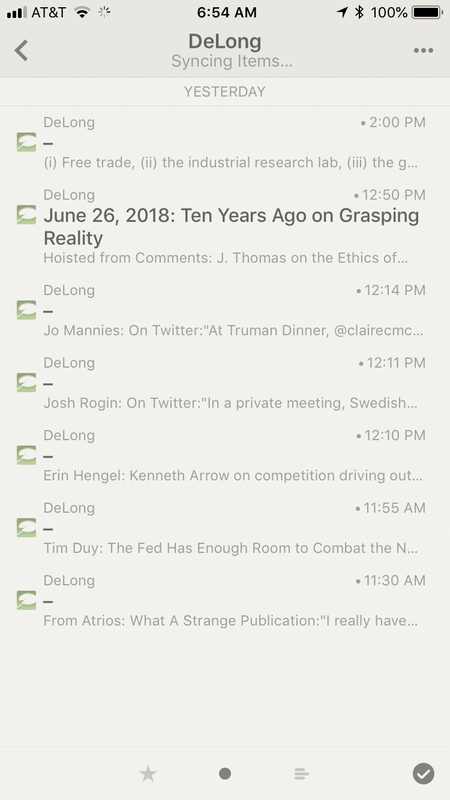 DeLong’s feed is largely subject free now: This annoys. If a post is more than a few sentences it needs a title. I scan hundreds of posts a day, only read tens of them. To see how things of interest relate add them all to your “want to visit” list then create a route (directions) that traverses them all. Apple’s iPad-only Swift Playgrounds (learn Swift) has been out for months. Today my Google search found zero comparisons of the two approaches. (Ok, it found one webspam algorithmically generated page. That actually counts as -1. Even five years ago Google would have found many by now. AR use case: Apple iGlass as heads-up display for augmented driving car. In the dense fog the child on a bike is surrounded by a pulsing golden circle. Apple would sell the sensors and computation to car manufacturers. Cost subsidized by car insurance discount. Apple insurance? We rely on Find Friends to support independent life for our special needs kids. Sometimes location tracking doesn’t work though — particularly on buses. Find iPhone.app has a great feature for phones in a family group. If the phone can’t be found it offers to notify when found. With Flickr’s acquisition by Smugmug I thought It’d try Aperture’s Flickr export again. Alas, it no longer works. I guess the API changed. You can still sort of export to iCloud photostreams as long as you don’t try simultaneously using Photos.app. I don’t recommend this though, I think it’s crashy under Sierra. I’ve seen photostreams obliterated and thousands of thumbnails scattered across an Aperture database. I do miss the glory days of photo sharing. I’m mildly curious to see if Apple will introduce shared Libraries and Library Management for Photos.app. What a disappointment that product has been. Why don’t we give anabolic steroids to patients on chronic corticosteroids? Yeah, I know anabolic steroids aren’t the antimatter equivalents of corticosteroids. Still, one tends to build muscle and bone, and the other tends to eliminate them. I wonder why we don’t give them together? A quick PubMed search didn’t help. On a cellular level, what stimulates your chondrocytes, the stem cells that grow new cartilage, is cyclical loading. It’s a pattern of force that’s associated with things like running, jumping or weight lifting. These cells aren’t stimulated in the same way by lower-impact activities like using an elliptical machine or cycling. For cartilage to remain healthy and regenerate in the way that it does for someone who is in their teens or 20s, the preponderance of evidence suggests that cyclical loading in the form of running or weight lifting is a really effective way to do that. To a physician of my age this is like treating asthma with smoking. Say they come to MN 7 years after California. What does that mean for MN? I don’t think I should expect a refund. I liked it for offline use, especially when traveling in areas with poor cell reception or where I had no data plan. This is how bad my Facebook ads are now … If I see an ad that’s close to my interests I click on it. Excluding those that I know, from past experience, go to unreadable sites. That’s unusual. Mostly I get featured articles from sites a friend supposedly likes. If I click on them I get a flurry of ads. Basically, garbage. We buy a lot of stuff. I have the credit card statements. My interests are easy to find, Facebook knows my Groups and Page Likes. AI need not apply, this is stone simple stuff. And yet … crap ads. Is anyone shorting Facebook yet? For some time I’ve been hiding or blocking irrelevant, uninteresting, misplaced or repulsive Facebook ads. All done with Facebook’s tools. I’ve even directly modified my ad interests. My ads are getting less relevant and less interesting. This is nuts. My family does a lot of stuff. Our Amazon spend is scary. There should be useful ads. Something is broken. 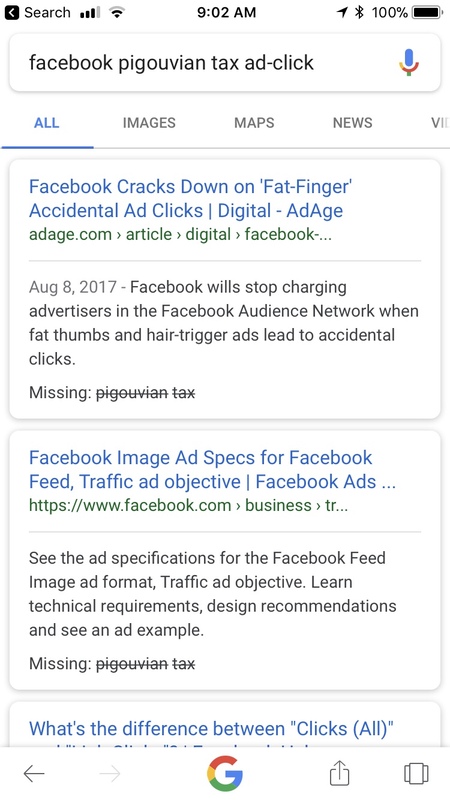 As of April 2018 Google has no hits on the concept of Pigouvian taxation of ad-clicks as a core mitigation of the Facebook-Google problem. My posts don’t show either of course; once Google would have found them. So there may be others like me, but nobody with an audience. I’m disappointed Krugman or DeLong haven’t brought this up. I’ve lived through several OS transitions. Microsoft did them best. Their transitions had the lowest expenses and the least data loss. Apple did the biggest transition. 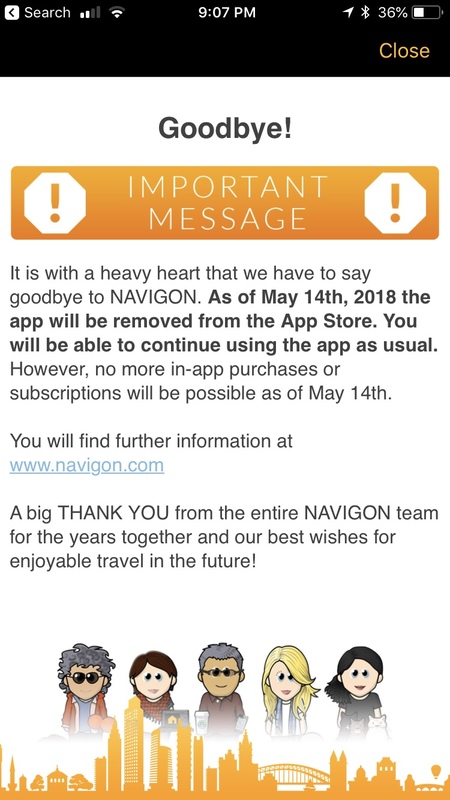 OS/2 and GEOS died. We all expect another transition from Apple; some mixture of macOS and CPU transition. This follows on years of Apple macOS disappointments — for me, above all, the way Apple ended Aperture. I expect this transition to go badly for me. So my Apple relationship is officially cold. Not divorce yet, but the lawyer is in Contacts. I’m not buying anything from Apple unless there is very clear immediate value and a clear exit strategy. I’ve ended our family Apple Music subscription. I’ll look for an alternative to iTunes movies. No earPods, no Apple Watch. I’m staying on Sierra and Aperture through 2019. Divorce will be painful, but Apple is likely past redemption. Its path lies elsewhere. The world is hard for the ungifted – bugs. Google Maps wouldn’t let me switch from bike to drive directions. App state was confused, the left most icon inaccessible. So I switched from bike to walk. That reset the app state and made drive accessible. A routine bug workaround. In the iOS 11 era we run into this sort of thing a few times a day. Barely notice them any more. There are so many bugs. Apple has the most now, but they are everywhere. The bike share I used this morning has a 15 sec delay in releasing a bike, if you don’t know that then you think the transaction failed. A bug equivalent. If you are a global genius you may not notice these. If you merely have a knack, and are not yet too old, they are a minor annoyance. If you are an Old, as I am, they are ticks of the reapers clock, they take a bit longer to solve from year to year. Ahh, but if you don’t have a knack … you didn’t get the academic gene, didn’t go to college, didn’t get the orthogonal geek gene … then this might be Hell. A regular reminder that you are not Elite. That the world has moved on and left you behind. That what you have, what you can do, what you have done … it doesn’t count any more. Imagine what that feels like. Who do you vote for? Lots of interesting findings in second half of this post. Survey results are often visceral – but still worth knowing. I said “Hey Siri, remind me to fix Kateva”. (Shorthand for fix Kateva.org/sh). Siri created a reminder “Fix Kateva thunder desensitization”. That isn’t a random error. I believe I had that as a task name in ToDo.app – years ago. Spotlight can’t find it on my iPhone now though. ToDo can’t find it either. So where did Siri get that from? Ad-click business models are a civilizational threat. Tax the click. 3. Ads on kitten videos and white-nationalism and “viral content” got more clicks. 4. The algorithms encoded this knowledge and began tailoring content based on interest “hints”. Lately researchers have been quantifying this. They found emotionally engaging content drives more clicks, and it is easier to invent that content than it is to find it. So the mass web became a tool for disseminating false content. Basically the dark side of humanity is amplified by Pay-per-click advertising business models. The good news is there are obvious fixes. The same fixes used for other addictive social harms like tobacco. Regulation and taxes. For example, tax click-based ad revenue heavily. To know the enemy is to understand the fix. Did CSS kill tables on the web? Once upon a time there were fabulous tools for creating HTML tables. Twenty years later the dominant web authoring tool, WordPress, has no native table support. I have never gotten a good explanation for the death of tables. So I’ll venture a guess. I think it was CSS. I wonder if it’s just too hard to put HTML’s table model together with CSS. Update 2/19/2018: @clarkgoble creates his tables in Numbers then posts into MarsEdit (choose paste and preserve formatting!). I tried it and it works! I also installed the popular tables plugin for WordPress but it’s a poor substitute for native support. I wish MarsEdit did tables, but they didn’t make the recent big update. The power of The Enquirer … and of Rupert Murdoch. So we know now that the White Working Class media buys up stories to silence them. This gives them great power over the powerful. This is how Rupert Murdoch built his empire. Once the stories are released the power dissipates. Putin’s pee tapes aren’t worth much now. I tested. With Prime routinely 1-2 days later than predicted. Without Prime long delays before shipping. I signed up as student with edu account. Six months free then half price. This is an old weirdness. Phone.app shows a “Favorites” list. The list includes phone number references of course, but it can also hold FaceTime audio (UI for adding FaceTime audio is obscure), FaceTime video, and Message references. Favorites only show in Phone.app, not in Messages.app or FaceTime.app. Favorites should logically be its own app or a part of Contacts.app, not a part of Phone.app.